Kicking off the keynote, Apple’s senior vice president of Software Engineering Craig Federighi said that over 55 percent of active Mac users are using Yosemite. 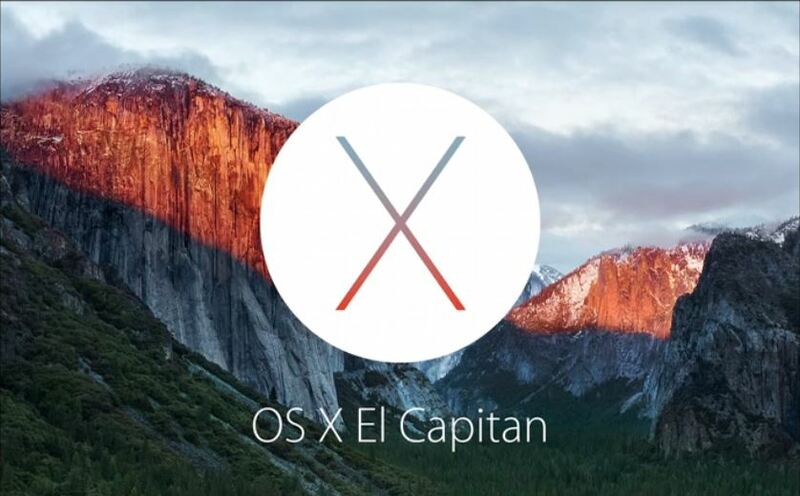 He also announced the name of the latest OS X 10.11: El Capitan. New features headed this way include new gestures, such as shake to enlarge mouse cursor, and a new way to pin websites on Safari. The browser will also add a speaker icon on the URL bar to mute music coming from any tab opened. Spotlight is also getting more contextual. Instead of looking for files by name, you can now describe what you’re looking for, such as “Files I worked on last June” to bring up documents last edited at that time. El Capitan will also allow users to split their screen into multi-tasking windows (Windows 10 style) by holding the Maximize button and dragging left or right. Lastly, OS X 10.11 is getting the Metal 3D graphics SDK to improve gaming and apps on its desktop. Apple says this should accelerate app launches by 1.4 times, and make it twice as fast to switch between apps. El Capitan is available for developers today, with a public beta coming in July and a full, free rollout to all this fall. The core improvement Apple wanted to make on iOS 9 this go-round was adding intelligence to the operating system. Federighi started the segment off with Siri’s upcoming improvements. New “context sensitive” features include the ability to tell Siri to “remind me about this” and it will know you are referring to the webpage currently on Safari. If you receive a phone number but are not sure who’s calling, you can also ask Siri to search through your emails to find any matches. Siri can also suggest people to invite for meetings, or apps that you might like your usage behavior during particular times of day. Apple also unveiled an API for search to help developers deep link their apps from mobile Spotlight searches. All of your searches and suggestions are not linked to your Apple ID or shared with third parties. New improvements are also coming to apps like Notes and Maps, indexing links on the former and transit information on the latter. When you look up businesses on Maps, it will also give you info on whether or not they accept Apple Pay, because of course. Additionally, Apple announced a new app for iOS 9 called News to personalize news content, updating anytime the user opens the app. The Flipboard-like app include graphics that adapt based on the news source’s site aesthetics, and allow users to browse publishers for top stories. News will roll out first to the US, UK and Australia. Some updates coming to the iPad: New gestures are being added such as using two fingers to tap on the keyboard to turn it into a touchpad. This is helpful for when you want to drag text during an email, for example. 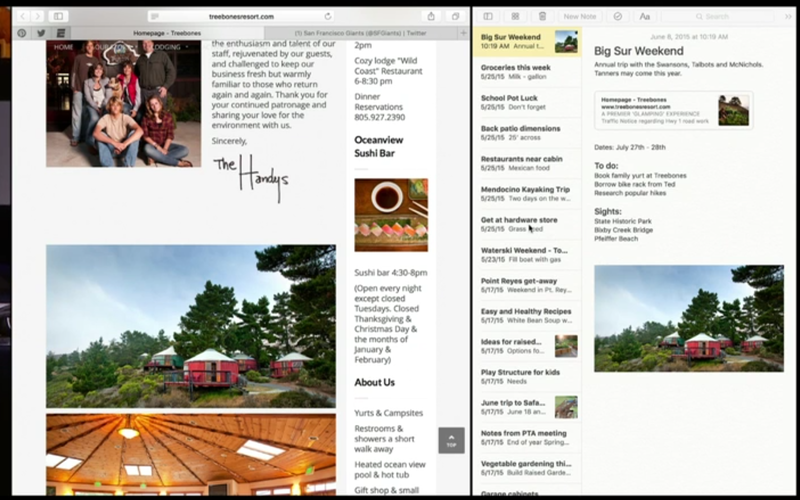 Multi-window support is also coming to the iPad, much like OS X El Capitan. You can also simultaneously scroll on both screens… if that’s your thing. There’s a new slide-over view as well, so you can drag in another app from the side for a quick glance while you’re using another app in fullscreen. This could be useful for when you’re watching a video and want to quickly check your Twitter feed, for example. 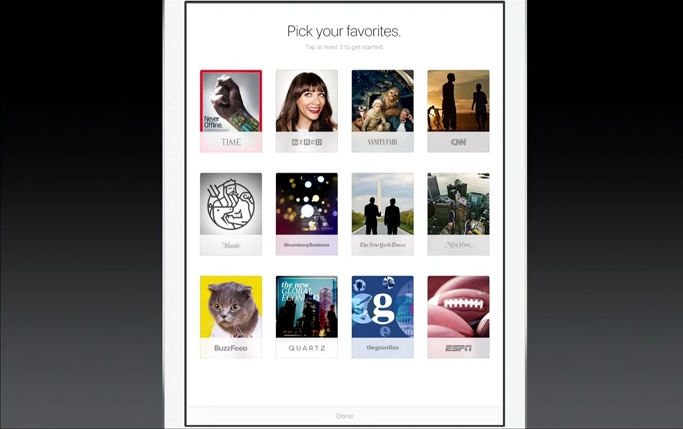 You can even switch between apps and have the video playing picture-in-picture. Last fun fact: While it took 4.48GB for users to upgrade to iOS 8, iOS 9 will need just 1.3GB. Just like El Capitan, iOS 9 is available for developers today, with a public beta this July and a full roll out in the fall. Moving on to Apple Pay, Jennifer Bailey, head of the division, announced that Square will launch a new reader that that supports the service. She also said that the recently-announced Pinterest buyable pins will be compatible with Apple Pay on iOS. Craig Federighi ran through a quick update of new support headed to many of the Apple developer kits. These additions include hydration and reproductive health support on HealthKit, more Kits for gaming development and carbon monoxide alarms on HomeKit. After rushing through all the Kits, Federighi announced one last big bit of news: Swift 2.0 is coming, and it will be open-sourced. Compilers will be available for both OS X and Linux. Before talking about the new version of the watchOS, Apple touted its latest App Store numbers: It has recently surpassed 100 billion downloads and paid out $30 billion to developers. On to watchOS: New watch faces are headed to watchOS 2, such as a Photo Album face to rotate through your pictures in the background (e-picture frame style). Developers can also make their own “complications” by showing data for anything you want right on the watch face, from flight times to sports scores. Users can rotate their digital crown to “Time Travel” and see ‘future’ data, such as appointments later in the day and what the weather will be like at that time. Other updates include the ability to respond to emails, watch videos and make FaceTime audio calls straight from the Apple Watch. You can also tell Siri to start the Workout app without ever touching the watch. The aforementioned Wallet and live transit data via Maps are headed to Watch, too. Apple also touched upon the new WatchKit support recently teased, such as the ability for Watch to work with known Wi-Fi networks rather than via a connected iPhone. HomeKit will also be natively on the watch, so you can control your home temperature from the digital crown, for example. Taptic engine and accelerator information will be made available for developers as well. 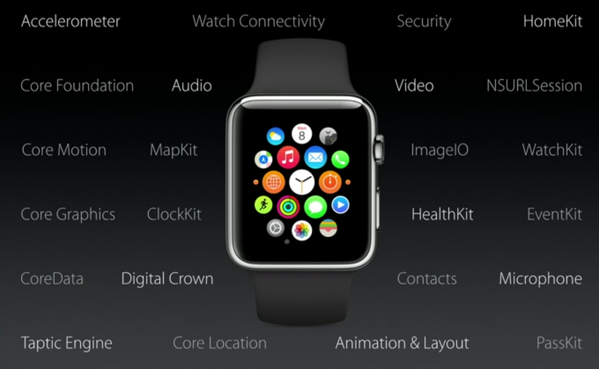 The new WatchKit and watchOS 2 is available today for developers, heading to everyone else in the fall. Naturally, Tim Cook ended the keynote with the traditional “one more thing” tease. Today, Apple officially confirmed Apple Music, its streaming service powered by iTunes. Users can search their content on “My Music,” or find song recommendations in the “For You” tab. It’ll also show you the song that’s coming up next to prepare your ear drums. To power “For You,” Apple Music will ask about your musical preferences to source songs, artists and playlists. You can also browse “Hot Tracks,” “Recent Releases,” “Top Charts” and even ad-free music videos. To talk more about Apple Music, Beats’ Jimmy Iovine joined Cook on stage. He says Apple Music will give users “the right song, at the right moment” – one way of doing this is via its radio station, Beats1. Guess where that name comes from. Beats1 is a 24/7 global radio station, hosted by former BBC Radio One DJ Zane Lowe. The service hopes to not only play great music, but help users discover new content. Artists can upload their work to Apple Music Connect to help increase their exposure, regardless of whether they’re signed. 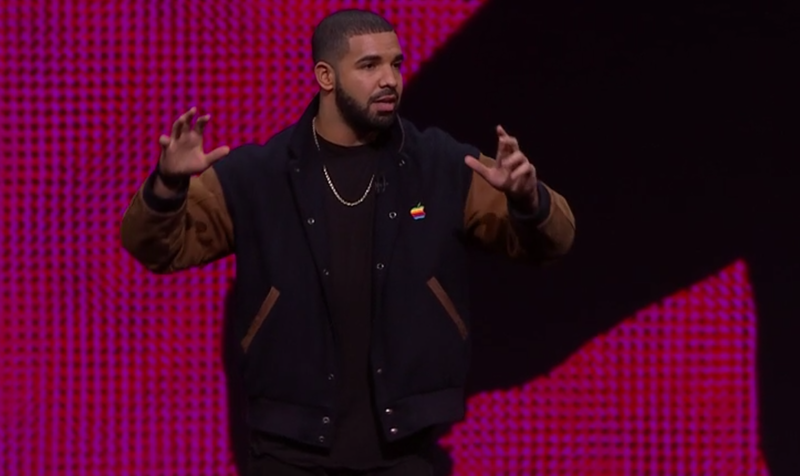 Apple’s even got Drake on stage to talk about Connect and how modern musicians can connect to their fans. Apple Music will launch on June 30 for $9.99 a month. A family plan will also be available for $14.99 a month for up to six members. Android support is coming in the fall. And that was WWDC 2015! What are you most excited about coming off this keynote? Sound off in the comments below and vote in the poll. Read next: Inside Steam's new refund system – Friend or Foe?